White Room Laser Ltd - Laser Treatments in Plymouth, Devon. Offering laser tattoo removal and more. White Room Laser works to provide professional laser treatments for all of our clients. Our team are fully trained in all procedures and use only the best equipment. We can provide; Tattoo Removal, Pigmentation Reduction, Fungal Treatments and Carbon Skin Rejuvenation. 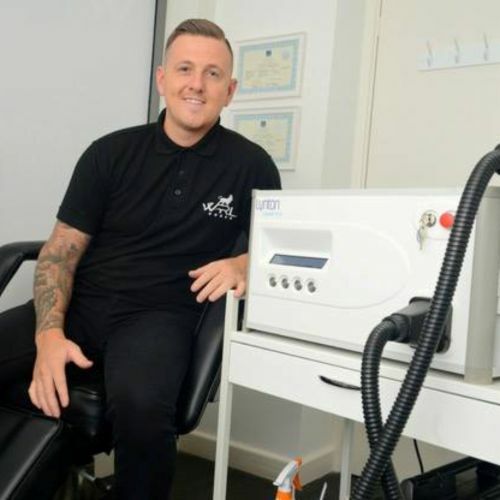 We are located in Plymouth, South Devon and we provide many laser treatments to our customers here at Whiteroom Laser Ltd. For more information on our company please get in touch with us. We’ve listed some of the most frequently asked questions below for some of our interested clients, if you have a question which isn’t listed below then please feel free to Contact Us to ask our team. As long as the procedure is carried out by a trained professional with certified equipment, the laser removal is highly safe. How long is the total process? Each session can vary depending on the size of the removal required, please contact us for more information about this. What are the after effects, if any? There are minimal.The tattoo removal site is at risk for infection. You may also risk lack of complete pigment removal and there is a chance of a scar. Is it painful to have done? Laser treatment has been likened by some of our clients to the feeling of having a rubber band snapped against the skin. Others describe it as a rapid succession of sharp pin pricks, or a warm, prickly sensation. Your skin will also need at least 5-6 weeks to recover between treatments. Laser therapy at White Room Laser is administered by trained experts, in a clinical, sanitary environment, minimising the chance of complications and infection. This is a question that we get asked quite often. You will need to have the treatment A minimum of once every five to six weeks over the duration of a course of 8-12 treatments. This course is often enough to remove the tattoo depending on the colour and depth of the tattoo ink in question. The information provided here may vary depending on various factors and treatment. Please contact us for more information. Your treatment will be performed by licensed laser technician. Schedule your appointment now!